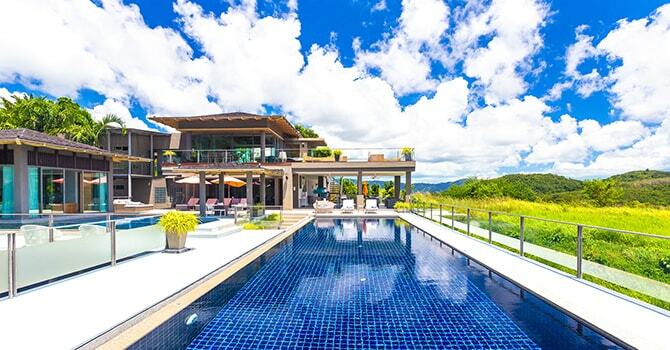 This stunning luxury pool villa is a truly unique oasis with panoramic views of the north west coast over the Andaman sea in magnificent Layan. 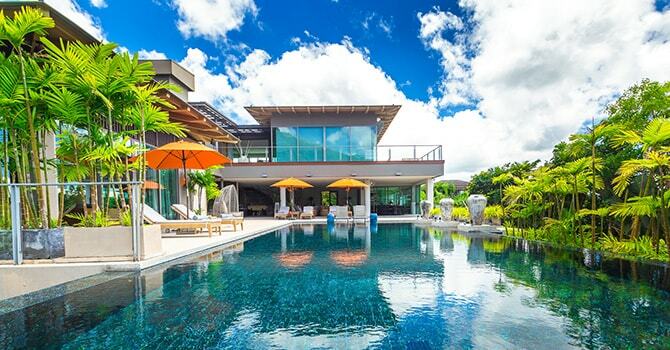 This incredible 7 bedroom modern luxury villa with stunning views of the ocean and tropical jungle is in a secured estate located on the hills overlooking beautiful Layan. 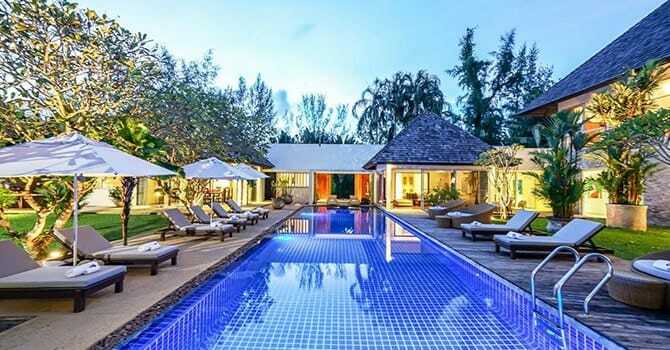 Villa Suriyan is 7 bedroom finest luxury villas on the island of Phuket with 3 swimming pools. 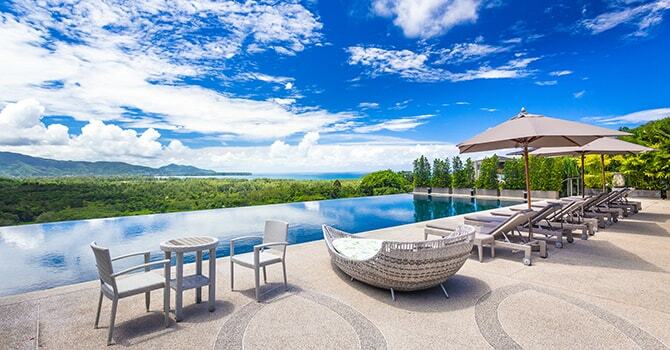 Overlooking amazing panoramic sea views over Layan Beach. Featuring a magnificent 65-ft private pool and 10-person hot tub, this luxury 5 bedroom Villa is an island oasis in Layan. This luxuriously furnished modern pool villa has 4 sumptuous bedrooms with wonderful sea views and is perfect for families and couples in stunning Layan. If you spend a while talking to people who have long visited Phuket, many will tell you they miss the 'old' Phuket, before there were too many tourists. Luckily, there are still plenty of places where the authentic tropical atmosphere remains: such as beautiful Layan. Layan is located on the popular west coast, on the northern side near the airport. 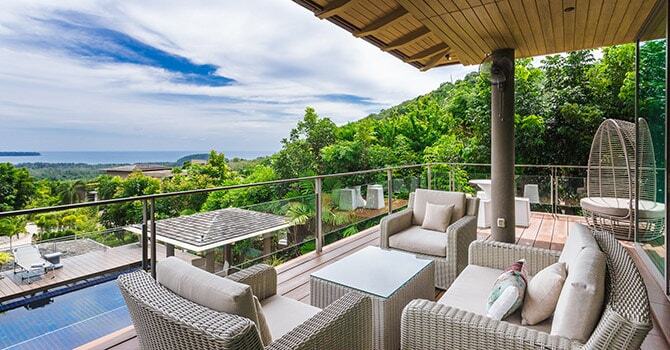 Although its location is near to Phuket's hotspots, it retains a quiet and peaceful charm with traditional Layan villas for rent and a selection of amenities to accommodate visitors. It is conveniently located for the Phuket Airport, which can be reached in about thirty minutes. It takes a little bit to find Layan Beach (which is part of the reason it is so quiet), however signs will help you to find the way, and most taxi drivers will be familiar with it. The beach in Layan is beautiful, with white sands and clear waters. It is a great swimming beach, owing to the fact that a small island is just off the shoreline, protecting it and keeping the waters calm, at least during high season. Swimmers of all abilities will enjoy the conditions at Layan Beach. As the area is not as built up as some others, many luxury villas in Layan are within close proximity of this stunning beach. It doesn't have the largest sand strip of all of Phuket's beaches, especially when the tide is in, however it is a very pretty beach and when the tide is out, there is plenty of room to wander along the coast. On the beach, you will find various loungers to relax in and enjoy the views out over the dazzling blue ocean. As it is relatively quiet, you can expect to have plenty of space to stretch out and take in the stunning, paradise-like views. Development has not been as fast around Layan as it has been elsewhere; and that is precisely why so many people think it is one of the island’s most beautiful beaches. At the end of the beach, there is a river where you can expect to spot a number of traditional fishing boats lined up. It is an interesting sight and makes for a beautiful photograph. In fact, if you are looking for somewhere authentically Thai, you'll love Layan, which is a popular weekend destination for Thais as well as foreign visitors. If you are feeling hungry, there are numerous restaurants and cafes within a short stroll that offer high-quality and authentic Thai dishes. All of these can be enjoyed with a fresh tropical cocktail or maybe a refreshing beer. As well as simply enjoying the serenity of the beautiful area, there are some fun activities on offer for the whole family. Certified divers can head out on an organised diving tour with one of the experienced dive shops or there are great snorkeling spots near to the shore. Another popular activity is to head out to the small island not far from the shore. Layan features several spas where you can enjoy a relaxing and rejuvenating massage or spa treatment with essential oils and experienced massage therapists. Not far from Layan is the ethical elephant sanctuary that offers safe and peaceful homes to elephants rescued from the circus and other inhumane conditions. The most well-known is the Elephant Retirement Park, where you can meet and bathe some 'senior citizen' elephants. Once the sun goes down, Layan has a selection of bars as well as the Dream Beach Club where you can indulge in a few drinks and dance to some great music. While the atmosphere remains laidback, the party can go on quite late so many a visitor finds themselves heading back in the early hours of the morning. Overall, Layan is a beautiful beach that harks back to the Phuket of old, when life was a little slower and the buildings a little shorter. Tight regulation over development in the area has meant that it is has retained much of its natural beauty, and it has authentic charm in spades; charm that is perhaps best experienced from one of the traditional Layan villas. So, if you are looking for a picturesque and relaxing place to stay in Thailand, you'd best start looking at Layan. Although it is relatively quiet, it can still get busy in the high season, and accommodation can be limited. It's a good idea to book early to ensure your dream stay becomes a reality.